To Sum It Up: Adelina Amouteru is a malfetto, left physically and permanently marked by the blood fever that devastated the nation of Kenettra. The blood fever also gave Adelina formidable powers, meaning that she’s one of the Young Elites, other survivors who possess superhuman talents. Adelina attracts the attention of the Dagger Society, a secret group of Young Elites that recruits other Elites before the Inquisition Axis, which views them as a threat, hunts them down. Adelina hopes that she has found safety and acceptance among the Daggers until some powerful leverage is used against her and she’s forced to choose where her loyalties lie. 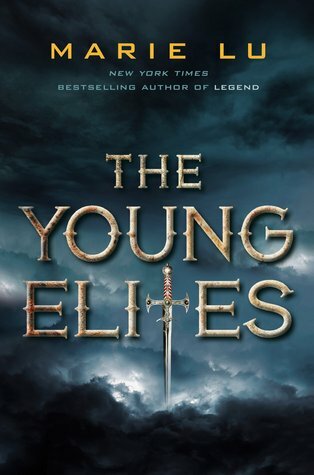 Review: For me, The Young Elites was the type of read that was loaded with potential, but that potential wasn’t always fully realized. The book has some really strong points going for it—a protagonist who thrives on darkness, a secret society whose members wield superhuman gifts, and a setting that evokes late medieval/Renaissance Italy. The world in particular intrigued me, but as with a couple of other aspects of the novel, I couldn’t help feeling that it wasn’t explored deeply enough. The main character, Adelina, is a malfetto; although she survived the blood fever that claimed many other lives, including her mother’s, she lost an eye and her hair turned silver. Some of the malfettos have also developed strange powers and are known as the Young Elites, Adelina among them. Her ability to create illusions feeds on fear and anger, and the more she uses her newly awakened power, the more she finds herself embracing her dark emotions and even reveling in them. I have to say, I really liked this character arc; Adelina is ostensibly the heroine of the novel, but she heads down a rather unheroic path. What can I say? I go for characters who aren’t 100% good, and often, the lower that percentage is, the more fascinated I am by them. I do wish, however, that the plot hadn’t been so centered around the big secret that Adelina obviously needs to keep to herself . . . or else. That never turns out well, especially when you definitely can’t breathe a word to the members of the secret society that you hope will accept you as a new member. I think my issue here was that I was looking for more complexity to the conflict beyond Adelina facing serious consequences if she didn’t remain mum. 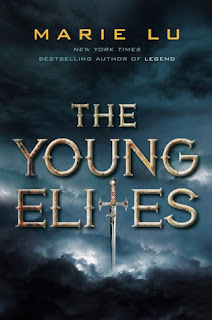 While most of The Young Elites is written from Adelina’s POV, a few brief chapters are told from the third person perspectives of Enzo, the leader of the covert Dagger Society that searches for other Young Elites, and Teren, head of the Inquisition Axis whose mission is to eliminate the Elites. Enzo is an instantly commanding presence on the page; I seriously couldn’t wait for his next scene. I thought he had a great backstory, too. Teren, fanatical in his belief that the Elites need to be eradicated, also has a lot more going on with his character than appears at first glance. I became really invested in what happened to both him and to Enzo, so much so that I would have loved more chapters focused on them. Like, many more. And I would have absolutely been okay if that meant less Adelina chapters. Overall, I still have some mixed feelings about this. There were parts that I very much enjoyed reading (i.e. every Enzo scene), but there were also stretches when it seemed like not much was happening other than Adelina worrying about her predicament and remembering the cruelty her father inflicted on her in an attempt to stir any latent power she might have had. I personally think that more is better with fantasy, and in this case, more layers to the plot, more details about the world, and more scenes with the two characters with the strongest presences were what I needed here. All in All: The Young Elites is more substantial than fantasy lite and has some solid building block elements, but I just didn’t feel that they reached the heights they could have. I don’t know about continuing the series; maybe if multiple first person POVs were added, I’d consider it. I know that I have this one on my to-read list because the concept really intrigued me. I'm saddened to see that while it's "good" it's still lacking that umph to push it into "great". It does sound like it could've used some better conflict. Her power and progression down the dark path is something to watch though and I believe it would interest me. I wonder if it gets better as the series progresses? Excellent review! That's exactly it- this book needed a bit more umph to it to really make it stand out. I'll be keeping my eye on the reviews of the sequel, which just released, to see if it might we worth checking out. Sorry to hear you're in a reading slump! I'm currently making up for all the reading time that I didn't have over the past few months while I was taking an online class for work. When I do hit a wall with reading, I'll catch up on TV or maybe knit for a while to regain my enthusiasm. Hope you break out of it soon! Oh I really enjoyed this one, I'm sorry it was not as great for you! Adelina is a difficult character though, and I hope she'll be more captivating in the next book (which I still have to read...) Perhaps when she truly embraces who she is. I did love that this story felt so different from YA fantasy of today, and I hope that continues with the next book. I liked the concept and especially the idea of the Young Elites, but I just found the book lacking in a few areas. Enzo getting more of a POV in the sequel would very likely sway me to read it though, lol!